Happy Saturday! Yesterday, I got a much needed mommy break. As much as I love being with my girls, every single mom needs a couple hours to herself every once in awhile. My mom also adores getting to spend time with them so it's always a win-win situation. I went to the BohoBlu headquarters so be on the outlook for some fun back to school and fall transitional looks soon! Afterwards, I did a little shopping at Sephora for a new lip color and at Loft to check out their new arrivals since everything is currently 40% off! I had already purchased this top and this dress but I wanted to try on a few other goodies for y'all and share the fit review of each item. 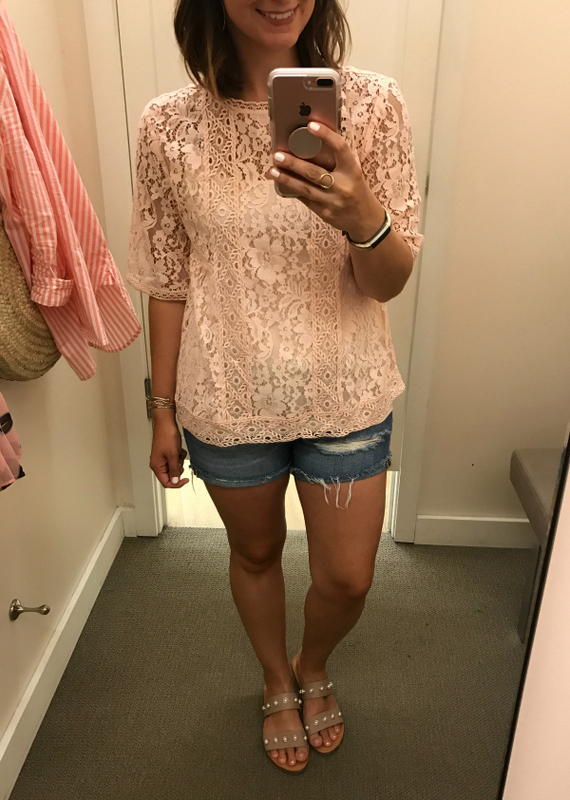 This lace top is the prettiest shade of pink! I added a cami in the same color pink underneath. The fit is true to size and I'm wearing a small in this photo. 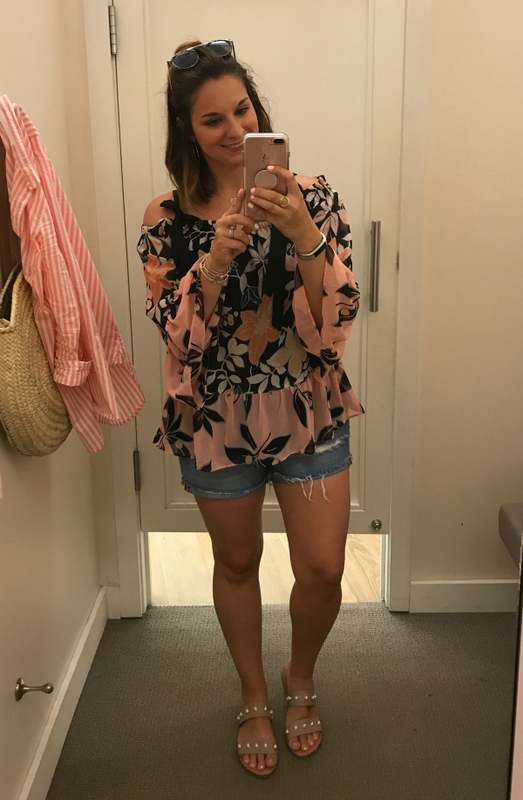 This off the shoulder top is seriously one of the prettiest tops I have ever found at Loft! The print and colors are just gorgeous. 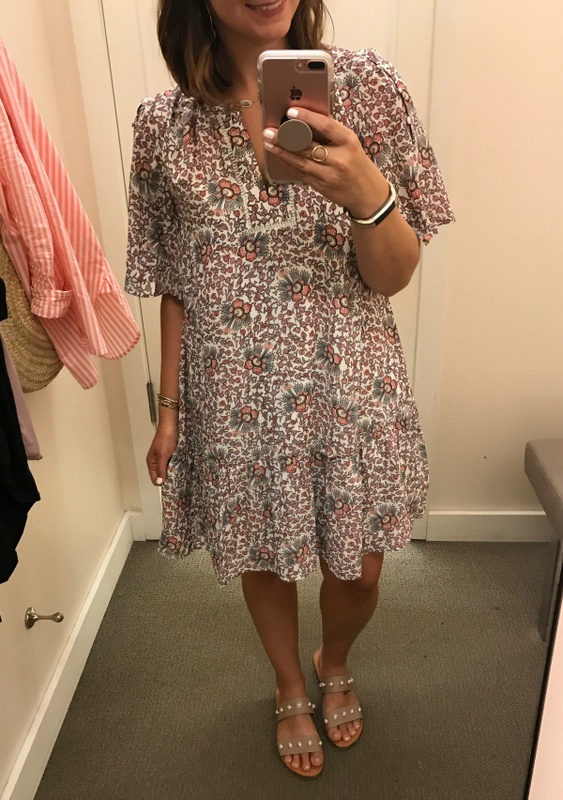 I'm wearing a small and the fit is true to size but flowy, which I love. 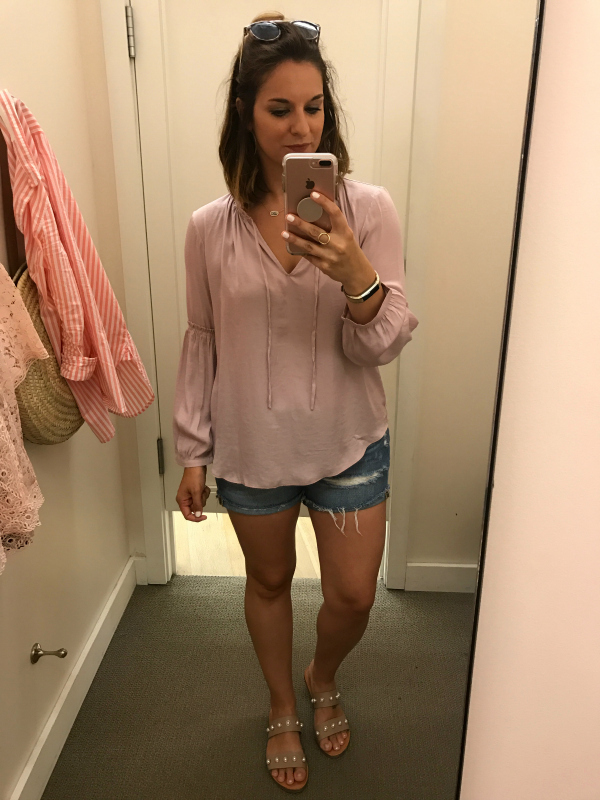 I wasn't sure if I would like this top when I spotted it on the rack but I feel in love with the style as soon as I put it on! I also love the soft purple color. 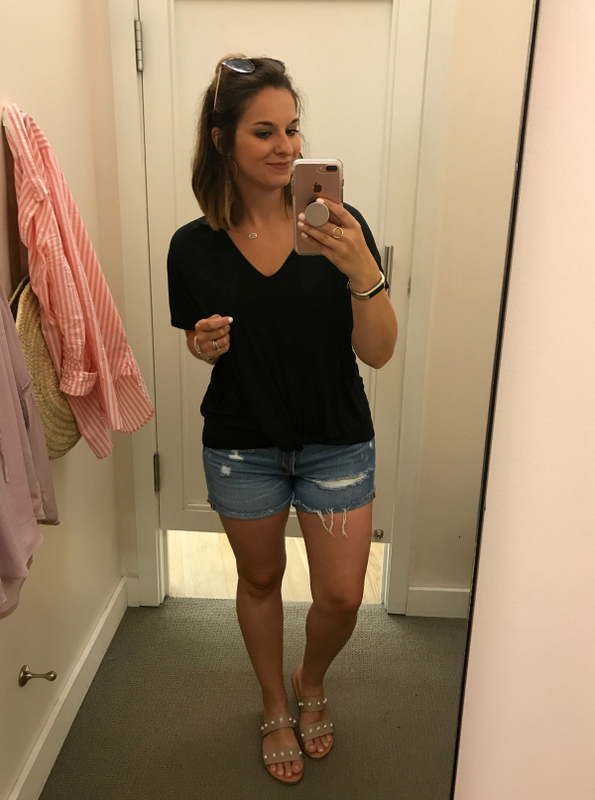 A great transitional top to wear now and later. I'm wearing a small and it fits true to size. I can't get enough black tops. 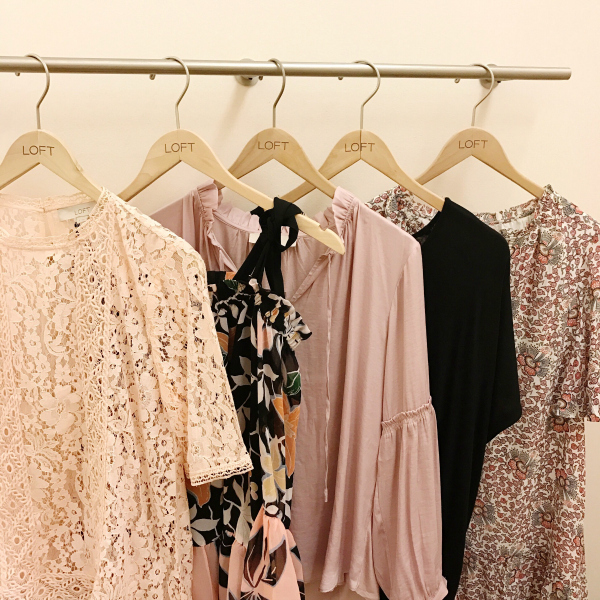 They are always my go-to when I'm not sure what to wear. I love the twist front and the v-neck style. This top runs true to size and I'm wearing a small. This dress is so much prettier in person and the fit is so fun. It does run a little oversized but I like it that way. This is a small but an extra small would have worked too, just depending on the fit you are looking for. I plan to wear it with sandals now and ankle boots later. Have a great weekend, y'all! Thanks so much for stopping by today!